Last week, C. S. Britton traveled with representatives from Carrollton City Schools to Asheville, NC for an adventurous training experience. Teachers from the Carrollton City school system had the opportunity to attend a training course on the fundamentals of river behavior along with representatives from C.S. Britton, Inc. 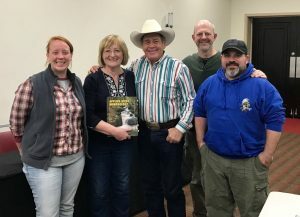 This introductory class familiarized attendees with the general principles of: fluvial geomorphology, sedimentation, hydraulics, restoration, fish habitat improvement, riparian grazing management and stream bank erosion. A combination of both lecture and field applications were provided amidst a beautiful, natural setting in Asheville, NC. 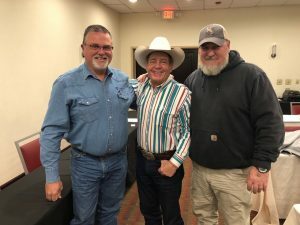 This informative training was led by Dave Rosgen, PhD, PH who founded Wildland Hydrology and is the leader in his field of Natural Channel Design. Dave is a Professional Hydrologist and Geomorphologist with field experience in river work spanning 51 years, twenty of which were with the U.S. Forest Service. He developed what is known as the Rosgen Classification system which is easily the most widely applied river classification system used in the U.S.
Preston Stephenson-C.S. Britton, Inc. Construction Superintendent; Dave Rosgen, PhD, PH Wildland Hydrology; Scott Britton-President C.S. Britton, Inc.
C. S. Britton, Inc. is excited to be a part of this unique opportunity to bring this knowledge back into the classroom. 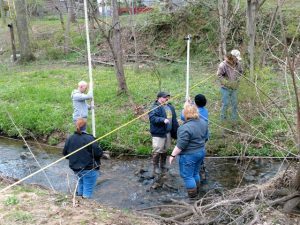 This training will allow these teachers to share a true “first-hand” perspective on the importance of stream restoration. C. S. Britton, Inc. is proud to partner with Carrollton City Schools in this educational opportunity. Email Melanie New for information on how your school can get involved!